Paula Hyman will be contributing columns to DCI.org each Wednesday. Here's her fifth installment. You may be wondering if I went trick-or-treating this Halloween. Umm, well if by trick-or-treating you mean worked a marching band show, then yes: I was trick-or-treating all weekend long. This past weekend was filled with band shows, just like any other during the fall here at the USSBA. The office staff was split up into groups -- each group having two specific shows that they were assigned to run. 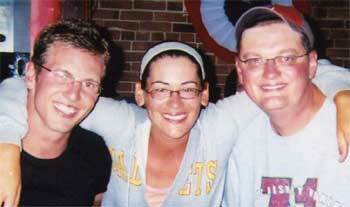 Paula Hyman (center) with Dean Westman (right) and Jon Bilby, in Bristol, R.I., on Paula's birthday (also a Cadets' free day). Dean was the Cadets' brass caption head and Jon the visual caption head.